The Camas Early Learning Center provides a fun and safe learning environment for all the kids enrolled. 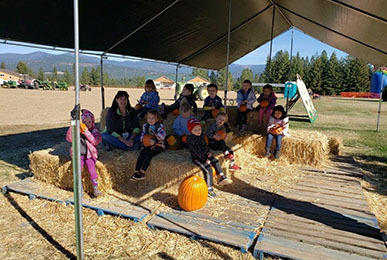 In October, Pre-K, Preschool and Toddler classrooms went to the pumpkin patch at Siemers Farm in Green Bluff and on Halloween, the kids were taken around to tribal businesses and offices to trick or treat while dressed in their costumes. The kids also enjoy year-round activities including swimming twice per week and frequently playing in the gym located at the Camas Center for Community Wellness. CELC has 33 employees, 17 full-time and 16 part-time, who care for the kids as if they were their own. Jeron Konkright, recently promoted to Program Manager for CELC, has worked in childcare for the Kalispel Tribe of Indians since August 2015. Five other employees have also recently been promoted within CELC: Shanda Piengkham is now a Language Specialist, Naomi Etling is now the Lead Infant Teacher, Kristi Kells is now an ECEAP Assistant Teacher, Shelley Sutton is now the Lead Toddler Teacher and Mary Russell is now the Lead 2nd-6th Grade Teacher. Teaming up with the Kalispel Tribe of Indians Language Department, CELC also incorporates the Salish language and unique Kalispel dialect into their daily activities making CELC a truly enriching environment.